The ChlorPlus-10 replaces the CGAC-10 20 mic Chloramine Reduction Filter which has been discontinued. The Pentek ChlorPlus offers multiple product solutions for chloramine reduction. Chloramine is increasingly becoming more common as an alternative to chlorine for water treatment. 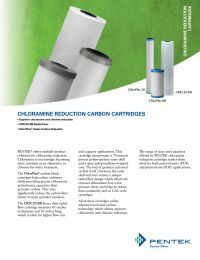 The ChlorPlus carbon block cartridges help reduce sediment while providing greater chloramine performance capacities than granular carbon. They also significantly reduce the carbon fines found in many granular canisters. It utilizes advanced activated carbon technology which allows excellent chloramine reduction as well as superior chlorine reduction.